Davis and Alligator Reefs: Davis and Alligator Reefs are two of several named reefs that lie offshore from Plantation and Tavernier Keys (Figs. 42B, 48B, 49A). Davis and Alligator Reefs, located ~11 km apart, consist of Holocene Acropora palmata on top of the fossil shelf-margin reef. 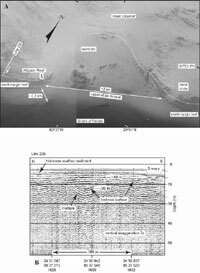 A seismic profile acquired near Alligator Reef shows that a sandy strip behind and paralleling the reef is a sand-filled bedrock depression (Figs. 49A, 49B, 50). These two reefs were the sites of an early study to sample offshore soilstone crust and mangrove peat for radiocarbon dating (Robbin, 1984). Soilstone crusts have long been recognized as valuable indicators of exposure to air (e.g., Multer and Hoffmeister, 1968; James, 1972; Harrison, 1977; Perkins, 1977), and mangrove peat is a valuable indicator of shoreline locations. Crusts occur at the bases of ledges on the landward side of Alligator and Davis Reefs in water depths of 7.2 and 9.2 m, respectively (Fig. 51A, 51B). The sites are deep enough that an airbag is required to lift the drill and core barrel to the surface (Fig. 52). 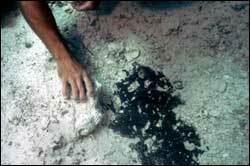 The Davis Reef soilstone encrusted the top of a buried Montastrea annularis coral (Figs. 51B, 53). At Alligator Reef, Holocene Acropora palmata had overgrown a layer of mangrove peat that had developed on top of the crust (Figs. 51A, 54). 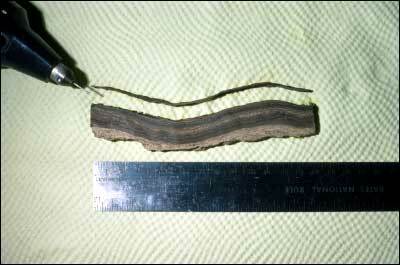 To sample soilstone crust for 14C dates, thin layers are extracted from vertical slices through the crust (Fig. 55). Conventional 14C dates calibrated to correlate with ages derived from precision age-dating methods yielded an age range from 16,505 to 15,405 cal. yr B.P. for the crust overlying the M. annularis at Davis Reef (Table 3). A conventional 14C age of 35,890±720 yr B.P. for the coral was outside calibration range and fell very close to the uncorrected dates from two M. annularis cored from bedrock at Southeast Reef in the Dry Tortugas (34,272±2,146 yr B.P. ; Fig. 6A) and near Marker G in the lower Keys (37,480±1,300 yr B.P. ; Shinn et al., 1977a). Alteration of aragonite to calcite in these corals biased the 14C dates as being too young. Lidz et al. (2006) used three types of local evidence to infer the most likely time of accretion of the three misdated corals: (a) late Pleistocene sea-level maxima (highest position was ~9 m below present level, Table 6, Toscano and Lundberg, 1999), (b) the youngest high-precision radiometric date obtained so far for the Pleistocene shelf-edge reef (~77.8 ka, Table 5, Multer et al., 2002), and (c) the oldest radiometric date on a Holocene coral (~9.6 ka, Table 4, Mallinson et al., 2003). All data indicate that sea level between 77.8 and 9.6 ka had remained below elevation of the shelf. The three corals were inferred to belong to the last Pleistocene highstand at ~80 ka that produced the youngest reef framework in the bedrock (Fig. 37A, 37B). Florida corals from that highstand have isotopic ages ranging from 86.2 to 77.8 ka (Toscano, 1996; Multer et al., 2002). A conventional 14C date of 6,770±210 yr B.P. on the Acropora palmata that overgrew the Davis Reef crust (Fig. 51B; Robbin, 1981) yielded a corrected age range of 7,655 to 6,795 cal. yr B.P. (Table 4), establishing a maximum time of about 7,655 years ago for Holocene reef initiation at Davis Reef. This time is consistent with an older age for the underlying crust, which represents subaerial exposure by the lowered sea level, and with approximate time of flooding of the shelf during the Holocene marine transgression. 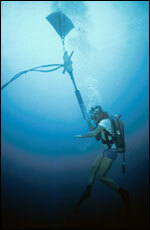 The top 2 cm of crust at Alligator Reef (water depth 7.2 m) had a corrected age range of 7,979 to 7,500 cal. yr B.P. (Fig. 51A; Table 3; Robbin, 1981). 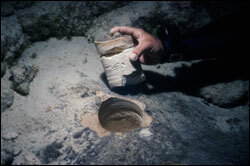 An adjacent mangrove peat sample (water depth 7.2 m) yielded corrected dates of 8,545 to 8,195 cal. yr B.P. The juxtaposition of soilstone crust and mangrove peat indicates irregular surfaces of the underlying bedrock. Crusts can form only on limestone high enough to allow for alternating conditions of wet (rainfall) and dry (recrystallization). Peat tends to accumulate in somewhat lower areas where moisture would be more constant. The slightly older peat in this case is consistent with its formation in a depression that may have been surrounded by accumulating calcrete. The lowermost layers of calcrete were not dated.